A source of energy and essential oils to stimulate water consumption and appetite during disease conditions, shipping, weather change or stress. All-natural alternative to stimulate water intake & enhance immunity when antibiotics are not desired. Contains oregano, cinnamon, and essential oils. It's easy! One scoop per gallon of drinking water. 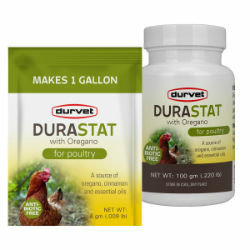 May be used together with other Durvet poultry soluble products. Mix 1 scoop (approximately 4 grams) per 1 gallon of free drinking water. Refresh water daily.